Welcome to WAM's Legislative Tracking Database! 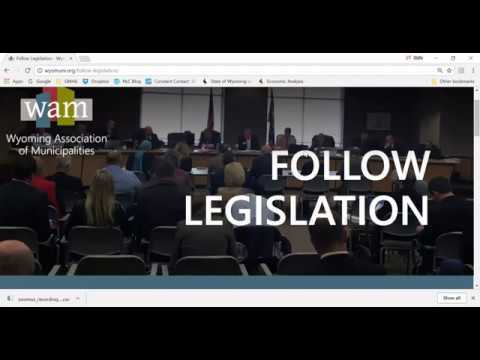 This is your "one-stop-shop" for legislative information that is important to Wyoming's cities and towns. From this page, you will be able to access all bills identified by WAM as having a possible effect on Local Governments. The bills can be reviewed by policy area, WAM's position, or legislative origin (i.e., House or Senate). You can also access key reports, presentation links or other information produced by WAM Staff and Members to follow legislative outcomes. Once a search is performed you may select the bill number's live link to access the bill text, status information, and pertinent comments. If you would like to provide a comment, select 'Post Your Comments' and complete the form. NOTE: When in a search report, select the 'Overview' option at the top of the bill detail page to go back to the main page. Using the back arrow will not refresh the page. Please refer to this pdf tutorial, listen to an audio tutorial above, or feel free to contact the WAM office for assistance (307-632-0398 or mclaurin@wyomuni.org). For a Mobile Friendly view, download the WAM App 'wyomuni'.